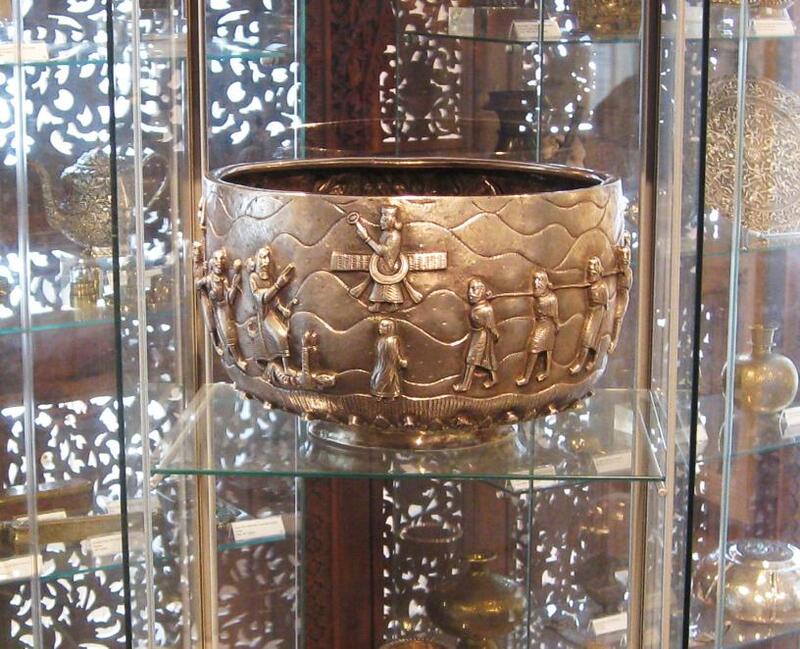 This extraordinary ceremonial bowl, commissioned by the Alpaiwalla family, a wealthy Bombay-based Parsee family of bullion dealers, is decorated in unusually high relief with Parsee/Zoroastrian themes. A near identical bowl (there are slight differences) is in Mumbai’s F.D. Alpaiwalla Museum and illustrated in Godrej & Mistree (2002) on page. 696 and also on the front and rear inside covers. 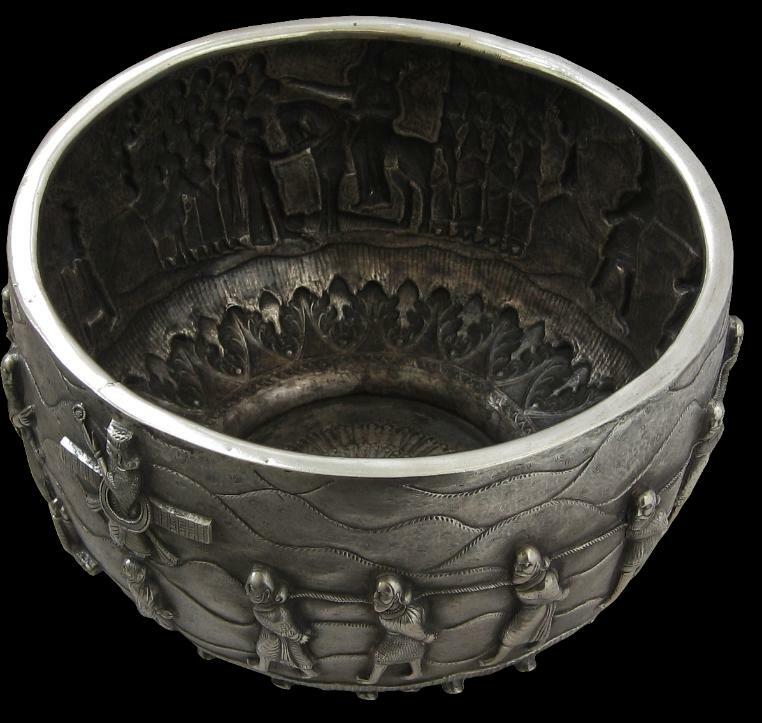 The Museum’s bowl was commissioned by F.D. Alpaiwalla as a muktad flower vase in the name of his father-in-law Bhownagree. 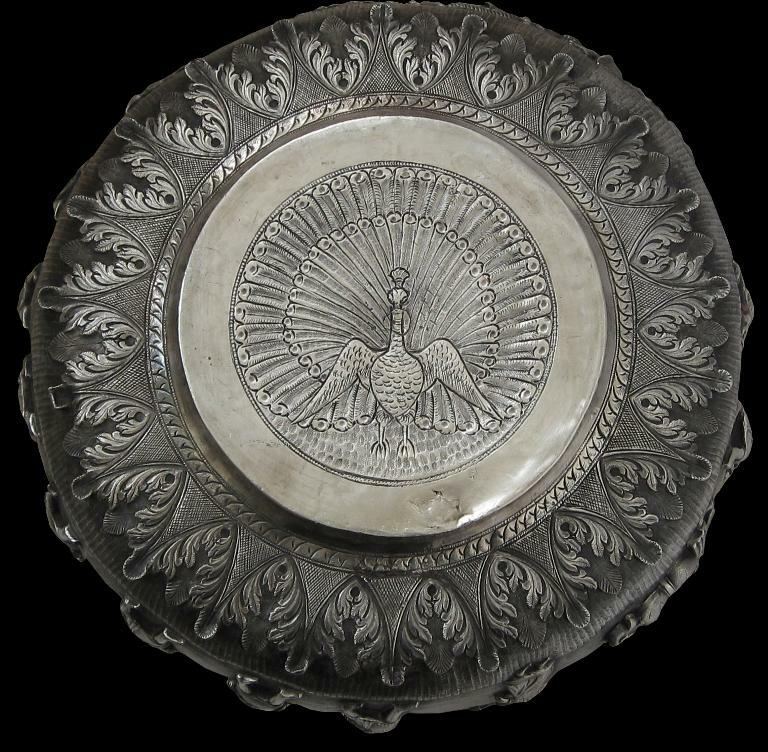 The bowl here most likely was commissioned at the same time from the same silversmith in the name of another Alpaiwalla family member. 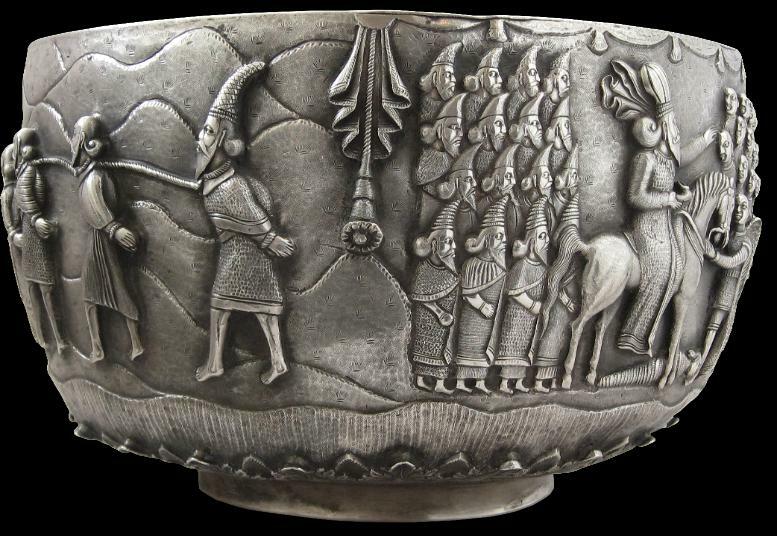 (Silver is a sacred metal among Zoroastrians; it symbolises purity.) Muktad vases are used during the Parsee ceremony of muktad, the annual prayers for the dead, celebrated in the last ten days of the Parsee calendar. The muktad days are set aside to remember the fravashis or spirits of the dead. One vase is commissioned for each deceased family member and during muktad, in a room set aside for the purpose, the vases filled with flowers, are placed on tables and blessed. A small fire is kept burning in the room for the ten days. Typically, vases are plain and not necessarily made from silver, making this bowl all the more extraordinary. 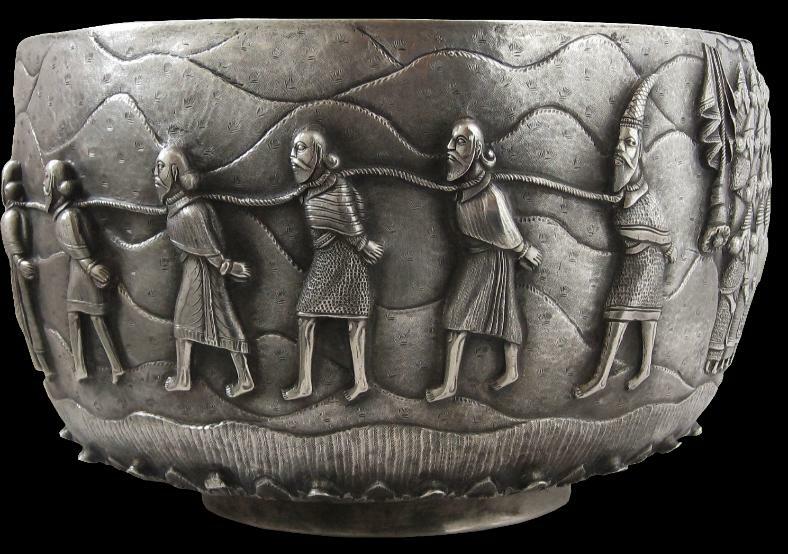 The bowl sits on a low foot and is made of thick-guage silver. 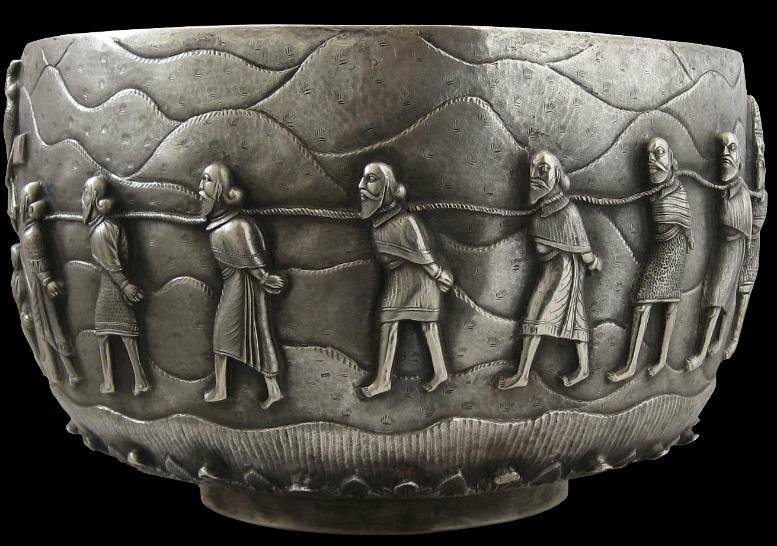 At more than 2.5 kilograms in weight it is heavy. 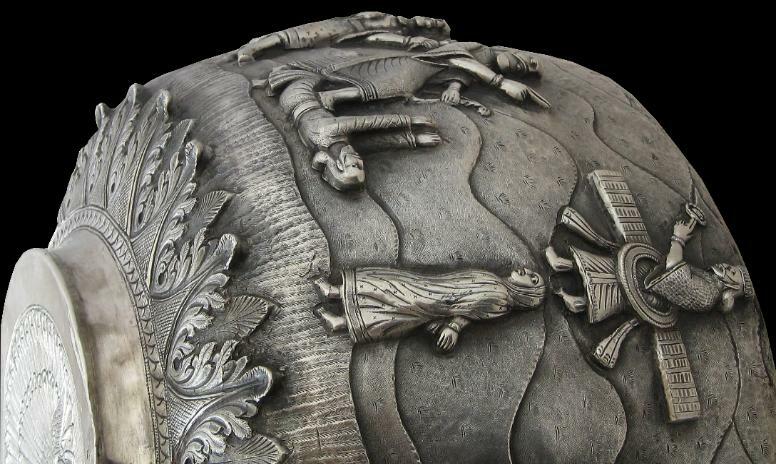 The bowl is repoussed in high relief with two main scenes. One scene is based on a rock carving near Bisitun, in present-day Iran. The image depicts Darius, the tallest of those present, with his foot upon the defeated Gaumata. Gaumata lies beneath Darius’ feet with his hands stretched upwards as if to beg for his life but in fact is about to be slain. The Zoroastrian deity Ahura Mazda, wearing his symbol, the winged disc, floats above, lending his divine authority to the proceedings. Darius’ gaze and right hand point up to Ahura Mazda. In Parsee traditions, this pose suggests that Darius is at prayer. 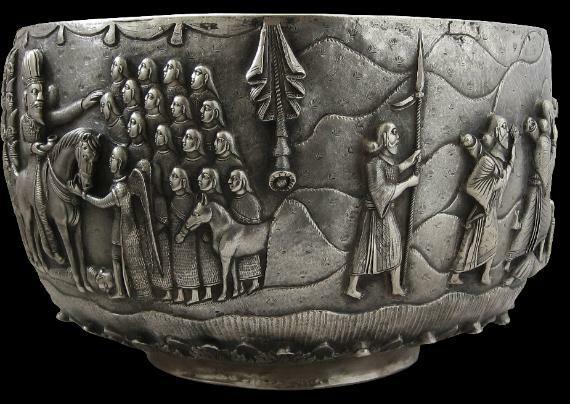 The other principal scene on the bowl shows Darius mounted on a horse, attended by an angel and with the body of Gaumata beneath. Darius is now crowned and he is anointing nobles. The lower part of the bowl has a fine, chased border of acanthus leaves in high relief. The base is engraved with an elaborate male peacock within a roundel. 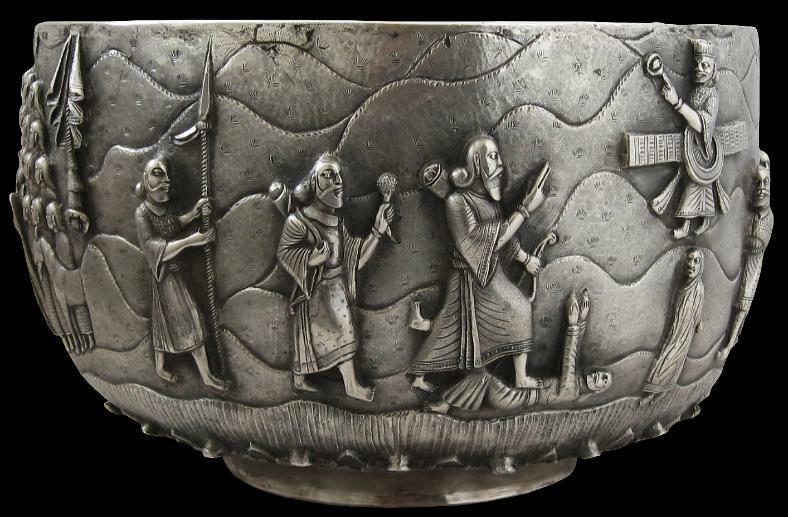 Engraved bases such as this served as the Burmese silversmith’s mark or ‘signature’. Makers who used the ‘peacock’ motif in so doing were claiming either current or past royal patronage. The work of such makers is nearly always of the highest quality. Darius is important to Parsee mythology. He was crowned king of Persia in 522 BC, and was the first of the Achaemenid kings to be confirmed as a true follower of Zoroaster. Ahura Mazda, proclaimed by Zoroaster as God, was mentioned and celebrated as Creator in many of Darius’ speeches. Under the kings of the Achaemenian line, the religion became one of the great religions of the ancient East. 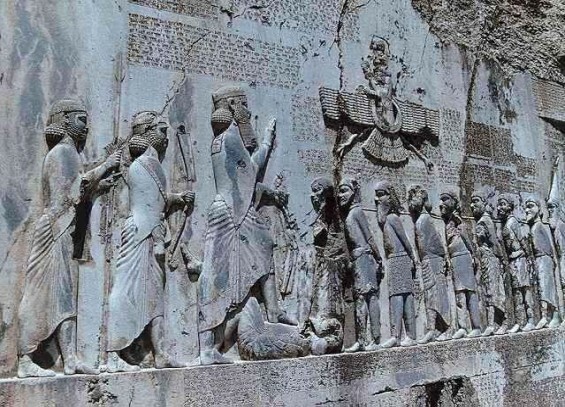 But it shared the fate of the Persian monarchy, it was shattered, though not overthrown, by the conquest of Alexander and it fell into neglect. With the Arab conquest in the seventh century came Islam and Zoroastrianism was vigorously repressed. 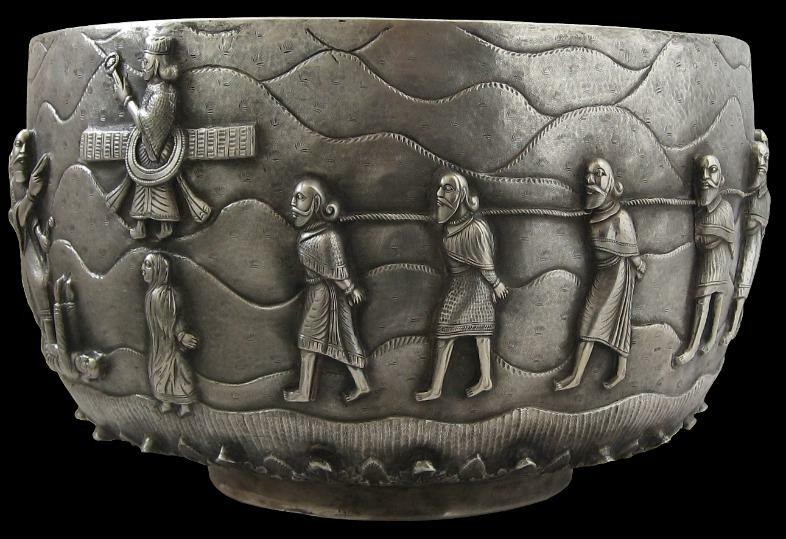 A group of Zoroastrians fled in 936AD to Gujurat in India. By the seventeenth century, most had moved to Bombay, with smaller communities in Karachi and Rangoon. (Later small communities existed in Singapore and Hong Kong.) The Bombay community today is the world’s largest, far exceeding the relative handful of Zoroastrians that remain in Iran. Zoroastrianism, as practiced by the Parsees, is one of the world’s oldest religion’s. It teaches the importance of the elements, particularly fire. Zoroastrian pilgrims had for example come from Persia during the Middle Ages onwards to erect temples and worship the then mysterious fire that shot out of the earth in certain parts of Azerbaijan, fuelled by underground wells of natural gas. A belief in the existence of angels is another important Parsee belief. Angels guide individuals and events. 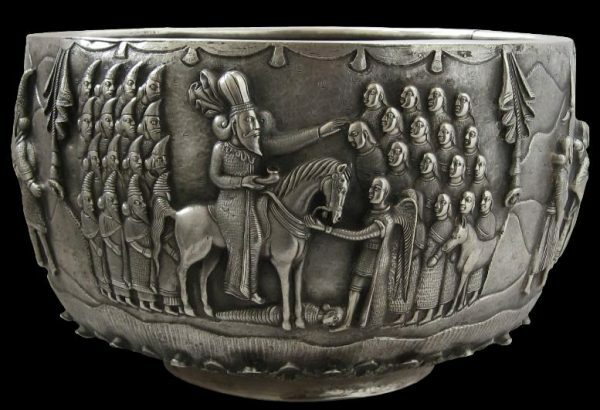 There is an angel on this bowl for example, guiding Darius’ horse. Each Parsee fire temple has a central, sacred flame that is never allowed to go out. (Mumbai has around fifty fire temples.) Traditionally, the bodies of dead Parsees are laid out in so called ‘Towers of Silence’ and crows are then allowed to feed on them. Cremation would ‘pollute’ fire and burial would ‘pollute’ the earth. In Mumbai, the principal Towers of Silence are adjacent to city’s so-called ‘Hanging Gardens’. Today, probably there are fewer than 140,000 Parsees or Zoroastrians worldwide. About 80,000 live in Mumbai (Bombay), a city of 14 million people. Another 6,000 live in Karachi in Pakistan. Like Europe’s Jewish communities or the Chinese of Southeast Asia, the Parsees of India and Pakistan are a distinct but exceptionally successful commercial minority. By the nineteenth century, Bombay’s Parsee families dominated the city’s commercial sector, particularly in spinning and dyeing and banking. In Burma, Parsees were involved in trading and financing too. Some were awarded ruby mining concessions in upper Burma. Well off though they are as a community, the Parsees are dying out. It has been estimated that a thousand Parsees die each year in Mumbai, but only 300- 400 are born. Today, one in five Mumbai Parsees is aged 65 or more. In 1901 the figure was one in fifty. Low birth rates are the main factor. Probably no Parsees remain in Burma today.